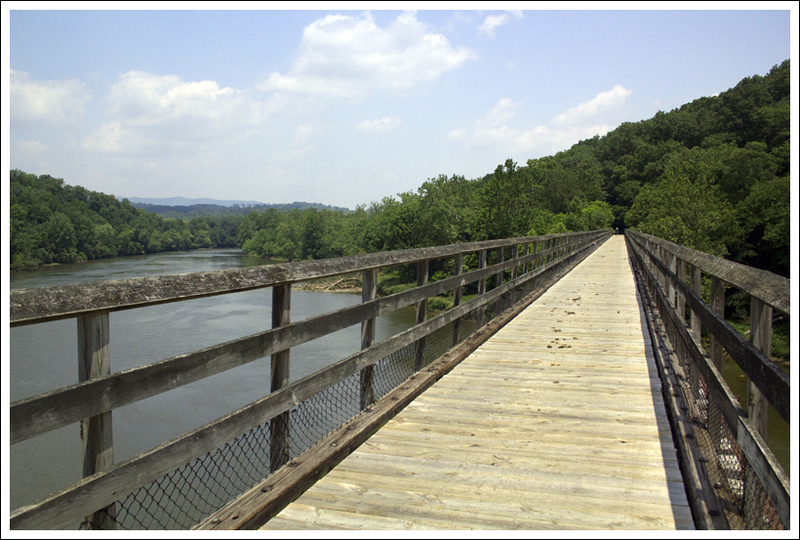 The New River Trail is a 57-mile rails-to-trails bike path. It starts in Galax or Fries and runs to Pulaski, following the New River closely for most of the way. We biked a 20+ mile section from Fries to Foster Falls. The trail was shady and lush! Below: One of the many bridges along the trail – this one crossed the New River; A view of the New River at Foster Falls; Adam looks at some small rapids. 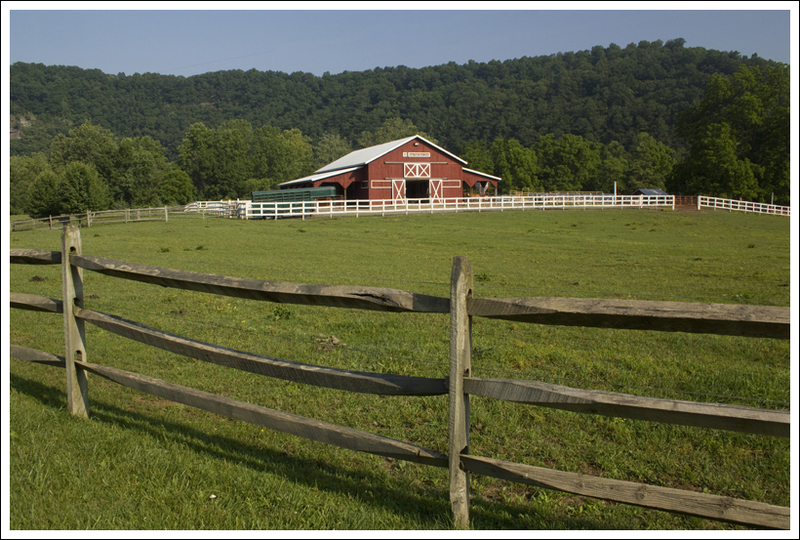 When we were originally planning our trip down near the Grayson Highlands area, we were planning to incorporate a bike ride on the Virginia Creeper Trail. 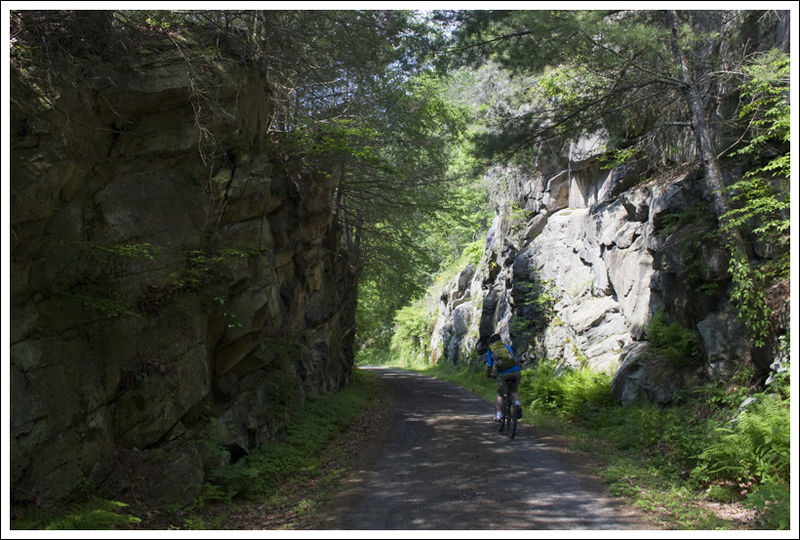 We had previously done the Virginia Creeper Trail from Whitetop to Damascas, but we wanted to do the entire trail. After doing some research, we found out that due to recent tornado activity, only 8 miles of trail is still available to bike south of Damascas. There are plans to restore it soon, but it kept us from going with our original plan. We were disappointed, but I had remembered hearing good things about the New River Trail. After discovering that we could still stay near Grayson Highlands and do this trail, we had a solution. The next challenge was trying to find a shuttle service to bike. After doing some internet research, I found a place called New River Trail Outfitters that offers the service. However, when I tried to call the numbers were disconnected. I’m not sure if they are out of business, but I couldn’t find any current information for them. The livery at Foster Falls rents bikes, canoes, kayaks and tubes. They also handle the bike shuttle service. 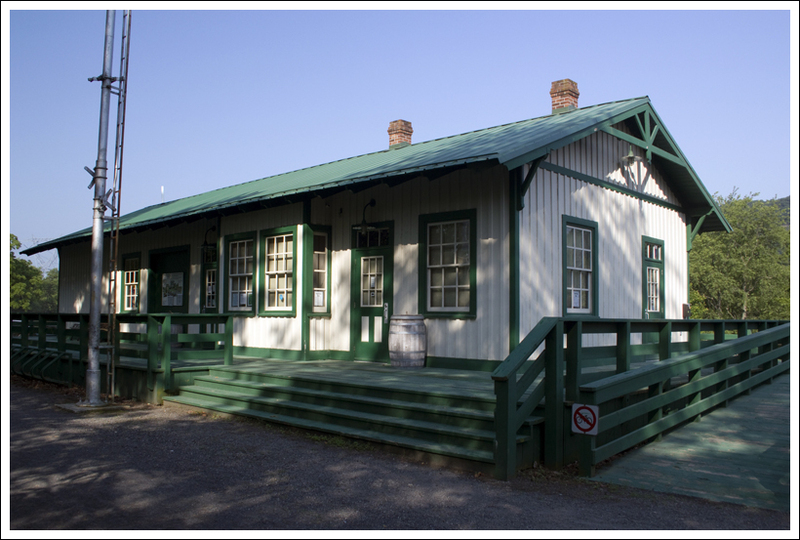 Below: The stable at Foster Falls, A caboose on display; Foster Falls has an old depot building now used as a shop. 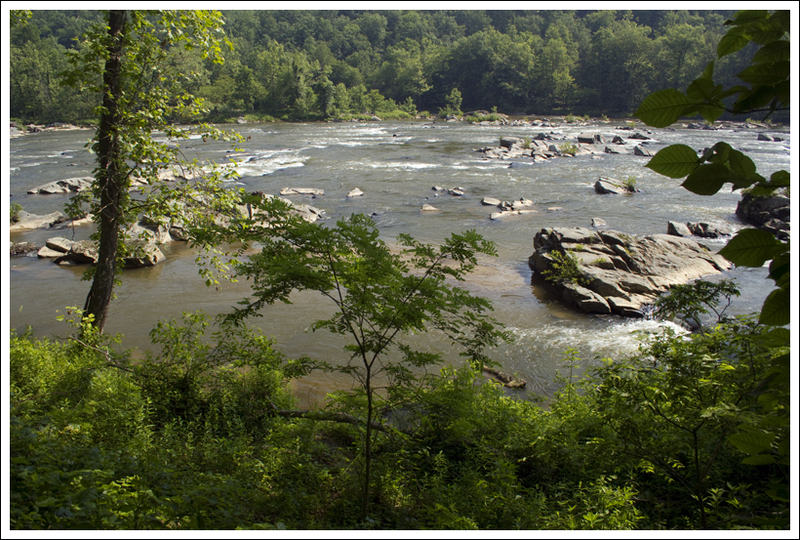 I then called the New River Trail State Park and found out that they offer a shuttle service. The park headquarters is located in Foster Falls. The cost per person to shuttle from Foster Falls to Fries or Galax is $25/person. When I called in for information, I found out they opened at 9AM. When I asked if we needed to make a reservation, I was told “No. You can just show up.” It’s definitely much more laid back than making shuttle reservations for the Virginia Creeper. Along the Creeper, shuttles fill up days in advance, so you usually have to make a reservation with a credit card well ahead of your trip. We decided to get there right at 9AM. The day was calling for temperatures in the high 90s, so we wanted to get most of the bike ride over before the hottest part of the day. We had to wait for a little while for a second employee to show up, but we were able to get our bikes loaded and we were off by about 9:20. It took about 35 minutes to get to Fries. We were thinking that it was going to be a very long bike ride, but the bike path is actually quite a bit shorter than the distance by car. 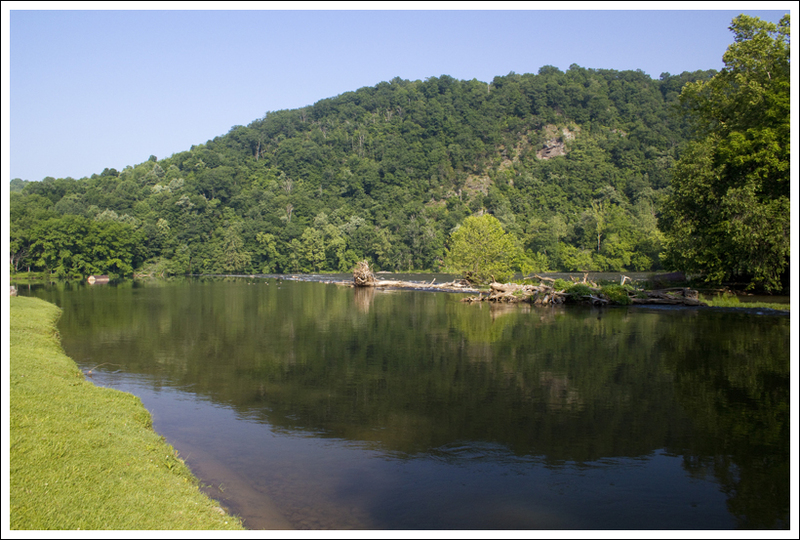 The New River Trail State Park is the longest state park, measuring a total of 57 miles, but only averages about 80 feet wide. 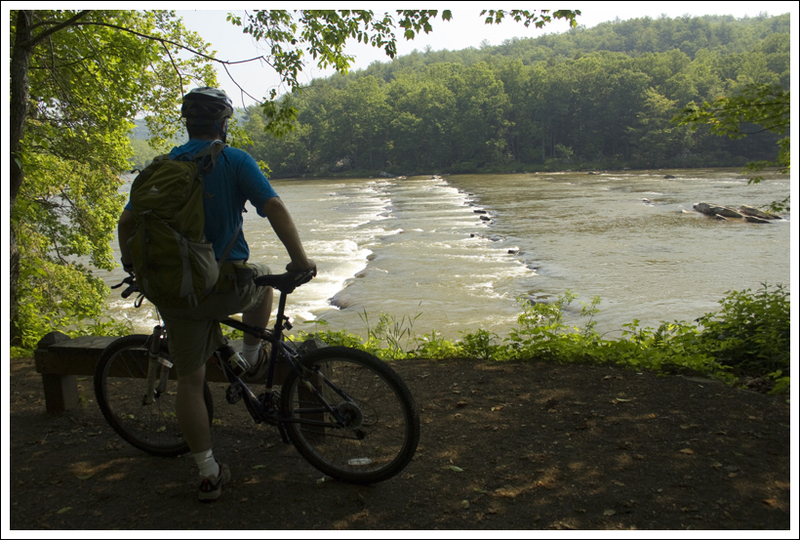 This is a state park with the purpose of biking, hiking, horseback riding, kayaking, or tubing. The guys operating the shuttle service says that most people choose to rent kayaks and float the river along the trail. Biking Across the Fries Junction Bridge. Below: A variety of scenery along the trail. I would recommend getting a copy of the bike map to take along with you. This path that we chose mostly takes place in the south section, but you will be 1.2 miles in the north section. We decided to go for the section from Fries to Foster Falls because we thought it would be a little more manageable in the heat than the Galax to Foster Falls section. The Galax to Fries Junction section would have meant another 8 miles of biking and doesn’t parallel the New River until it reaches Fries Junction. The bike path at Fries immediately starts by the New River. Right from the parking lot, we were able to see gorgeous views of the river. 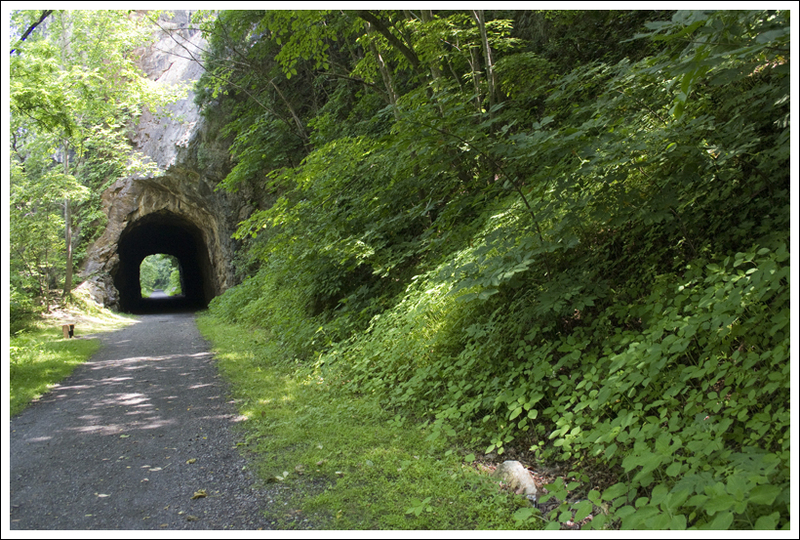 The trail takes about 5.5 miles to reach Fries Junction (which intersects with the trail from Galax). At Fries Junction, we did run into about 10 camp counselors that were biking the trail and talking about which colleges they were admitted to. I tried to keep quiet for a while, since I work in the JMU Admissions Office, but I did talk to one girl that was going to JMU next year as a freshman. We pressed on after a short break, following the signs to Pulaski (the terminus of the trail). We passed by Byllesby Dam (at mile 8.0) and Buck Dam (at mile 10.6). We stopped to eat a snack at Ivanhoe (at mile 13.7). Shortly after Austinville (at mile 16.5), we went through a short tunnel. This tunnel wasn’t that dark, so you most likely would not need a headlamp to go through. At mile 20.1, we reached Shot Tower. We parked our bikes and hiked up the steep stairs (which is tough after biking a while) to explore the tower. After we were done, we finished our ride back at the Foster Falls state park headquarters where we had started our trip. There are a few geocaches to find along the way for this bike ride. I definitely would like to come back and do some other sections of the trail. The section from Galax to Foster Falls is about 28 miles and the section from Foster Falls to Pulaski is about 22 miles. 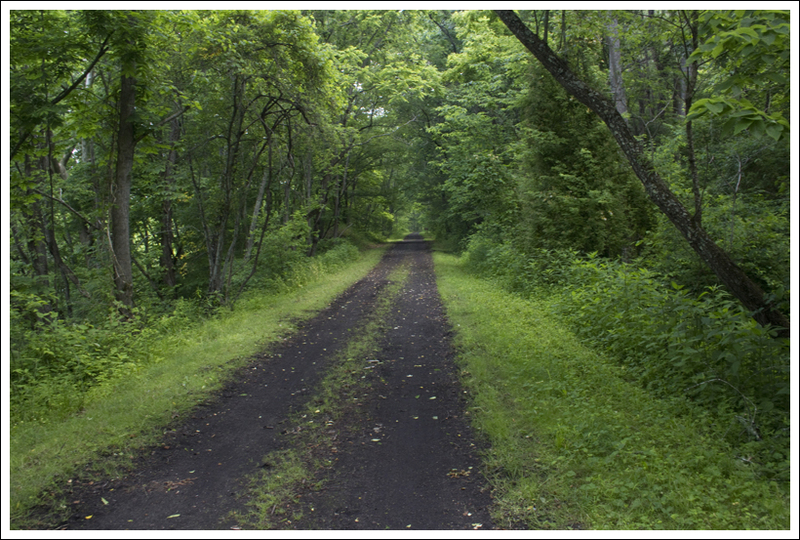 When we were reflecting back on the rails-to-trails bike rides we have done, we would put this only second to the Virginia Creeper trail. The New River Trail wasn’t our first choice for this mini vacation. 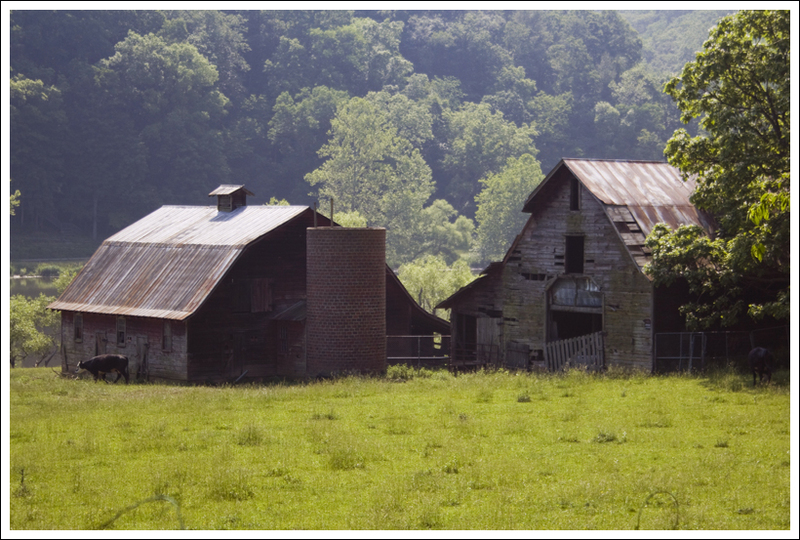 Initially, we had planned to head down to Abingdon and make a second attempt to bike the entire Virginia Creeper. Let’s just say we don’t have good luck when it comes to the Creeper. In 2009, it rained on us for 17 miles before we bailed out and caught a van ride back to Abingdon from Damascus, in 2010 I got bronchitis and was too sick to go when we planned, and in 2011 the section of the trail between Damascus and Abingdon was closed due to tornado damage. Apparently, some mythical force is keeping us from finishing that trail! This was the only tunnel we passed through on the section we biked. 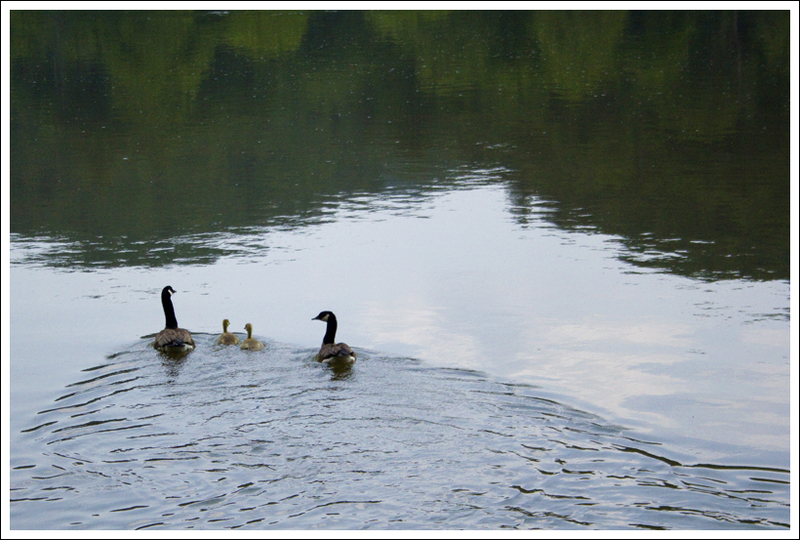 Below: Geese and goslings; Pretty wildflowers along the trail; Rocks and rapids in the new river. Luckily, Adam was able to do some last minute research and plan an alternate getaway for us that included biking along the New River Trail. 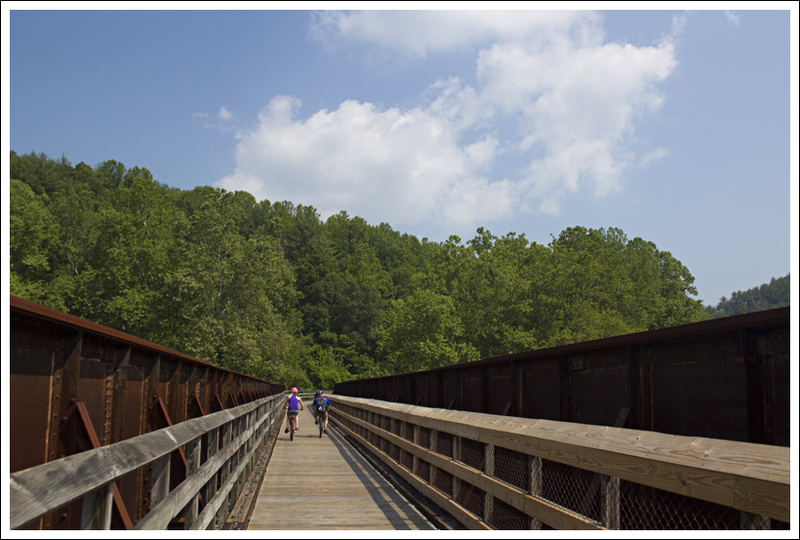 The trail is 57 miles long and passes through Grayson, Carroll, Wythe, and Pulaski Counties, linking the towns of Pulaski and Galax with a side spur of the trail linking to Fries. 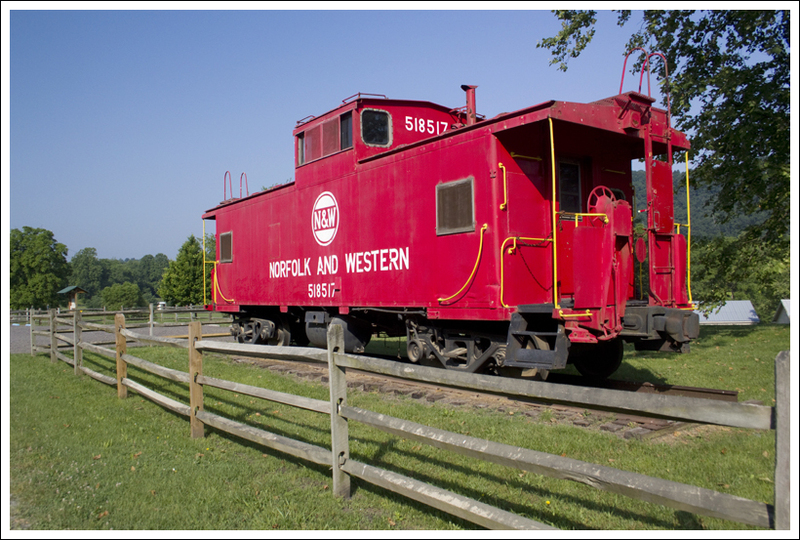 It hasn’t been around as long as the Virginia Creeper, so it’s not as well-known and the area doesn’t have quite as many bike-friendly amenities (shuttle services, bike shops, trailside cafes). But what it lacks in amenities, it makes up for with its beauty and solitude. 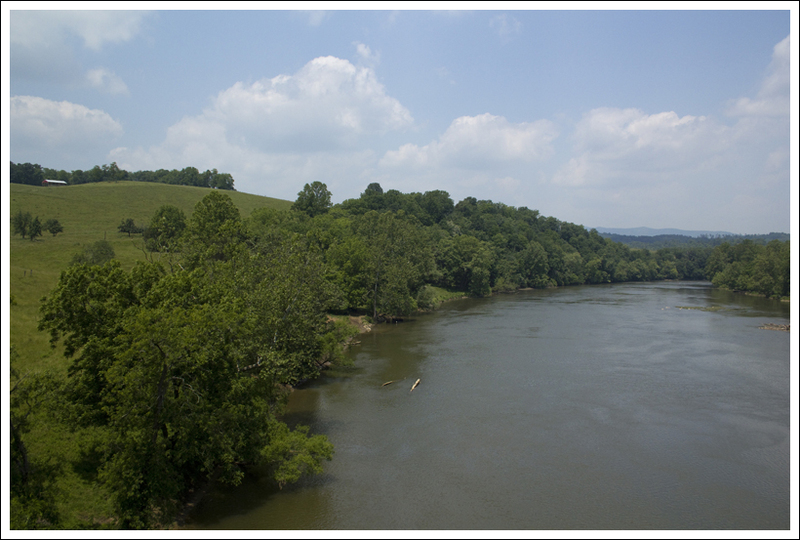 We saw fewer than two dozen people along the New River Trail over a 20+ mile span and greatly enjoyed the pristine river scenery. The trail was in great shape – smooth and flat, covered with fine crushed stone. 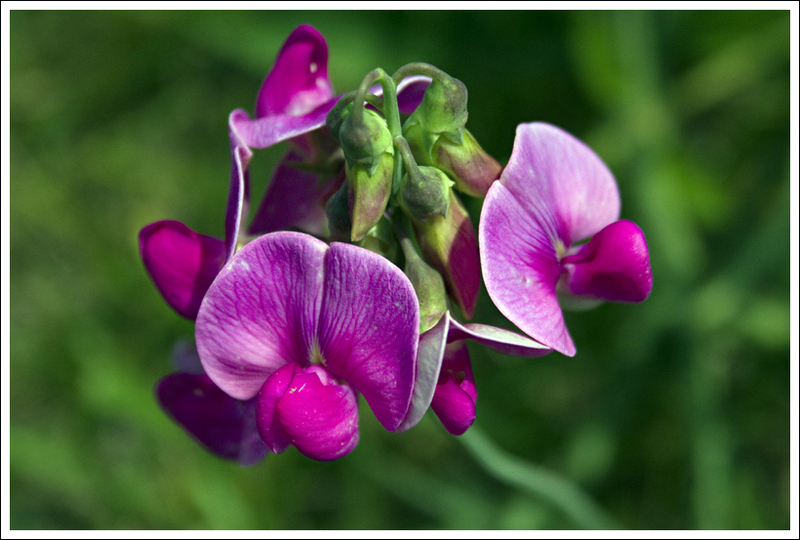 There were lots of pretty wildflowers along the path – snapdragons, mountain laurel and others I didn’t know. Every now and then, I’d catch a deer watching us quietly from the woods. We saw a pair of geese and their goslings hanging out at one of the primitive trailside campsites. The river was fed by many small streams cascading down the hillside above the trail. There were even a few small waterfalls flowing. The New River was spectacular! All the spring rain had water levels higher than average, so there were many rapids and cascades that probably aren’t there when the water is lower. The driver of our shuttle even mentioned that they had to cancel canoe/kayak/tube trips due to high water on the Saturday of Memorial Day weekend. It was close to 100 degrees outside on the day we biked, so that made it a bit uncomfortable. Although, once we got going, the breeze from pedaling along made the heat bearable. Thankfully, much of the trail passes through a shady tunnel of woods, so we were able to stay out of the direct sunlight most of the way. Nonetheless, I drank almost three liters of water and a 20-ounce bottle of lemonade over the course of the ride. I also ended up with a huge, salty sweat ring on the front of my shirt (GROSS!) and my legs were crusted with sweat mixed with gravel and grit (DIRTY!). I was not a pretty site at the end of the trail, but I had such a good time I didn’t care! Two things I liked best along this bike path were the Fries Junction Bridge and the Shot Tower. The bridge was neat just because it was so long and curvy. Shot Tower was interesting for its history. 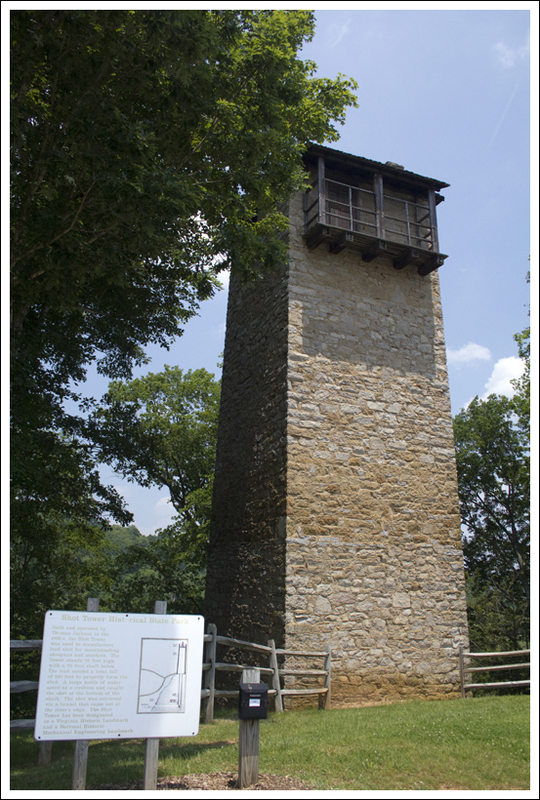 The tower itself sits above the trail. So you have to take a short, steep climb up a hill and several flights of steps to visit the tower – but it’s definitely worth the effort. Another little tidbit of history from the area is that Stephen F. Austin, ‘The Father of Texas’, was actually born in Wythe County, in a small town that now bears his name (Austinville). The trail passes right through that area. 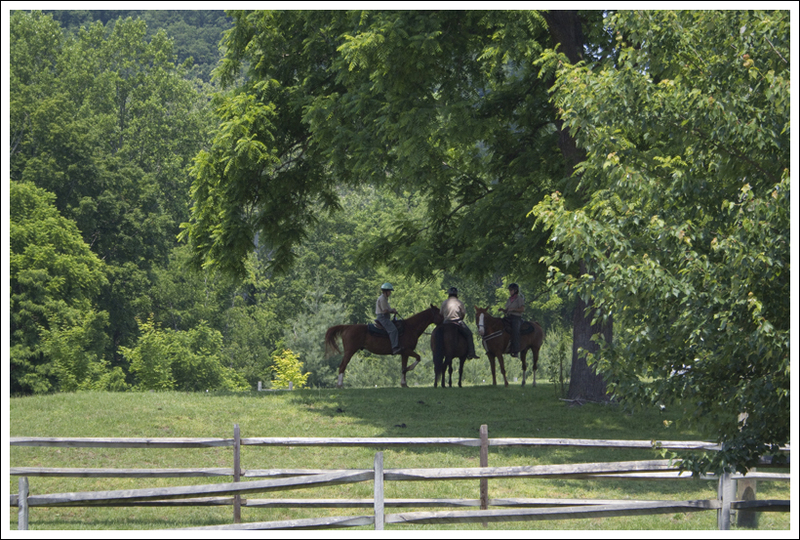 Park employees enjoy a shady spot on horseback. I would definitely make a return trip to bike more of the New River Trail! The state park shuttle service makes it so convenient. I also might want to go back and ride horses along the trail. Seeing all the horses at the Foster Falls stable really made me miss having a horse and going for long rides. After finishing up with our bike ride, we got cleaned up and headed into Galax for a movie and pizza. I was shocked that movies in Galax were only $4.00 for a matinee (as of 2011)! After the movie, pizza at RJ’s Pizza and Subs was delicious! They had really good and inexpensive food. Difficulty – 1.5 The terrain is extremely flat, so if you can do the mileage, you shouldn’t have a problem. Trail Conditions – 4.5. The trail is either very small gravel or dirt. It doesn’t get better unless you find paved trails. Views – 1.5 You don’t get views from high points, but there are a few nice unobstructed views of the river and some of the mountains around you. Waterfalls/Streams – 5. Most of the trail, you are biking along the New River. Wildlife – 2. We saw a couple of deer and a black snake on our ride. Ease to Navigate –4.5. The trail is very easy to follow and well-marked. Solitude – 2.5. This trail does get busy on nice weekend days, but it is not as popular as the Virginia Creeper trail. 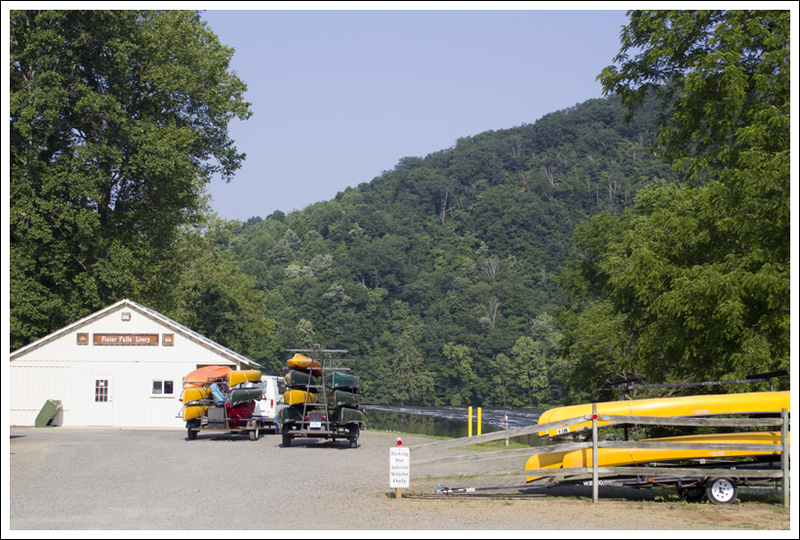 Directions to trailhead: For the headquarters of New River Trail State Park for the shuttle service, take exit 24 (69 East) off of Interstate 77. Take a left on to US-52 North. Go 1.5 miles and take a right on to Foster Falls Road/State Route 608. There should be signs directing you to the New River Trail State Park. There is a fee of $2 to visit the park. For the trailhead in Fries, VA, Fries is located off of highway 94. From Main Street in Fries, turn on Firehouse Drive. You should see the small parking lot and bulletin board shelter for the start of the trail at the curve on Firehouse Drive. Check out my GoPro videos of the Fries and Hiwassee sections! Planning to complete all 57 miles tomorrow. Thinking about starting shuttle services for through riders. Will have better understanding of needs after ride. Comments highly encouraged. Brilliant write up and pics! Thanks for sharing. Will definitely give this one a go. Thanks for your info. Your info is very helpful!! Going to attempt this bike trail this year. We did the crepper trail and it was fun. I liked that half way was a food place to stop. Any places to stop and get food or drink riding in the direction of Ivenpost from the shot tower and further??? There were very few amenities along the trail when we biked it. I remember being so happy and relieved that the shop at the Falls had cold drinks because we really didn’t see much at all along the way. It’s been a few years though – maybe some new facilities have popped up? GREAT ARTICLE. Have lived here my whole life and would suggest that your temperature readings were inaccurate, the highest temp ever recorded in Galax was 97 in 1988. Very rarely will we crack 95 and only once or twice crack 90 if at all in the summer. Averages are low 80s throughout the summer, what is prevelant however is the humidity, as a south wind seems to carry moisture from the Gulf of Mexico and ring out moist air over the ridges. I remember this summer well, it was hot, but it was not near 100 degrees. The coolness of our area relative to the surrounding lover elevations of North Carolina and the Piedmont of NC make this a very popular summer retreat. anyways keep up the great work. I love this site and it is a very great resource. If you haven’t hiked Angels Rest I’m Giles County I suggest give it a go. Steep hike but rather short (fourish miles). Great view overlooking the town of Pearisburg. The heat index on the day we biked was 99 – which definitely has a ‘real feel’ close to 100. Even if it wasn’t actually 100 degrees on the thermometer, it felt oppressive. 🙂 Thanks for the trail suggestion. We haven’t hiked that one yet. Wow, what a cool ride. It really was a great bike path! I think over time some more amenities will build up, which I guess is a double-edged sword. The solitude is nice, but it would also be nice to have more shuttle options for the trail.